As of July 9th, ticket sales for the opening and closing ceremonies of the World Nomad Games in Cholpon-Ata have started (http://worldnomadgames.com/ru/news/ru/V ... nikov-281/). Tickets can be bought at post offices in Bishkek, Osh and Cholpon-Ata, as well as online with the proper app. Slight problem: the organisation is hopeful their app will start working around July 20th. By then, the events might have sold out. Does anyone know if a local tour company in Kyrgyzstan could help out foreigners that want to buy tickets? Entrance tickets are strictly individual ("personal data of an individual, in particular a full name, photo, passport details"), but wouldn't sending a scan of my passport work so someone could buy tickets for me in person? If anyone can help me obtain tickets for both ceremonies for two persons, please send a PM. Thanks! I thought it was just me who was having issues! Good to know I'm not the only one. I'd also be interested if someone could buy a ticket for me in person! We can give the contacts of our partner in Kyrgyzstan. We specified from them about the possibility to buy only tickets. It's okay! But the ticket price will be more expensive, because the manager needs to go to the post office and stand in the queue for several hours. I advise you to unite and write to him. Over time, he will go and buy tickets. Accordingly, the costs to share at all. Is it possible to post the contacts? A tour agency in Bishkek offered me to stand in line at the post office for $30. That sounds ok to me, so I transferred that amount + ticket price. I sent them the documents they need (passport, photo). They told me I can pick up the tickets later in Bishkek at their office. I asked them to send me a scan of the tickets. As soon as I receive it, I'll post it here so you'll know if this works. 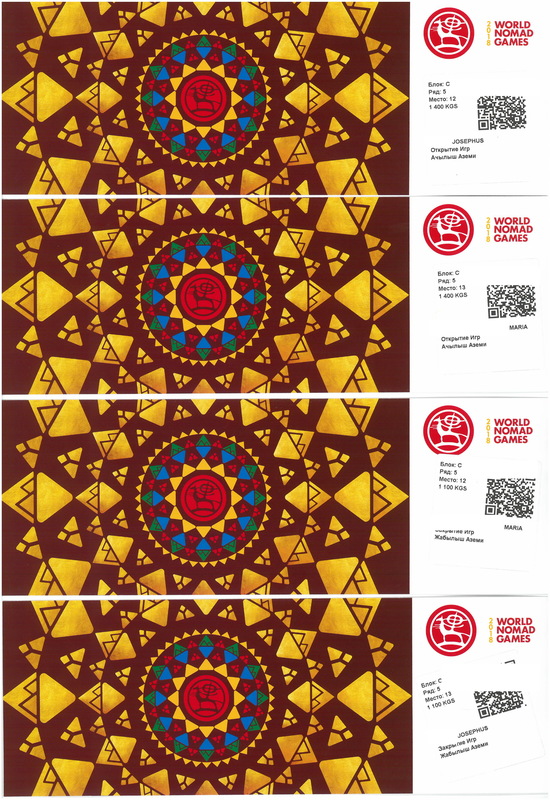 For those who don't want to risk missing out on the tickets as the World Nomad Games apps still don't work: I contacted [deleted e-mail], paid a $30 service fee (for 4 tickets in total; you could gang up if you want to split the fee) and will pick up the actual tickets at their office once I arrive in Bishkek. Last edited by steven on Mon Jul 30, 2018 10:15 am, edited 1 time in total. Out of interest (already have a ticket): why is the front row less expensive than the back row? Normally it's the other way around..
Maybe you can't see very far at ground level? Usual Uzbekistan embassy closing times for Nowruz?